Boston’s masters of psychedelic, fuzzed out, stoner doom, Ice Dragon, have been hinting at album like Seeds From a Dying Garden, for a few years now. The band’s first few albums, notably 2010’s The Burl, the Earth, the Aether, 2011’s The Sorrowful Sun and 2012’s Tome of the Future Ancients, saw a band delving in the realms of slow, fuzzed out Black Sabbath worship. They were certainly psychedelic and trippy, but the albums still mainly focused on heavy handed doom metal. Shortly after the release on Tome of the Future Ancients (three months to be exact), Ice Dragon dropped Dream Dragon, which was an ethereal journey through the skies; what sounds like the aural equivalent of tripping. The band began layering sitars and mandolins into their music, while focusing more on dreamy song structures. Sure there was still an elements of stoner-esque doom in some of the tracks, but it was certainly a far cry away from the band’s early material. 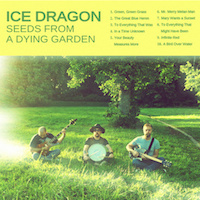 Two years, and four full length albums, later, Ice Dragon dropped Seeds From a Dying Garden, which was released in August of 2014. The album continues the band’s trend of making their music trippy and dreamy and ethereal, but with this go around the band completely subtracted hard rock and metal out of the equation. Folky acoustic guitar strumming, with an occasional nod to a southern, bluegrass style. If you doubt just how far from metal that Ice Dragon has come, just listen to “Mary Wants a Sunset”, with its jazzy percussion and clear guitar tone, which ultimately builds into a psychedelic segment that could have been released in 1960. The closest thing to past glories comes during “Beauty Measures More”, with some rather loud cymbal strikes and acid rock tinged bass lines. While the vocals on most of the album come across as simple, rather bland folk singer/songwriter type stuff, the performance on this track is stellar, with the singer bringing a clear, wide open tone reminiscent of Bobby Liebling or Ozzy Osbourne. Seeds From a Dying Garden can be seen as Ice Dragon’s complete abandonment of stoner doom as well as their total embrace of the psychedelic elements they’ve so closely held for all of these years. While this is not a metal album, by any stretch of the imagination, Ice Dragon makes this style work. They managed to make a folksy, grass roots styled album that still sounds like Ice Dragon. Definitely one to check out if you’re not afraid of psychedelic tripping and folksy singer/songwriter kind of stuff. This entry was posted in Reviews, Unsigned Reviews and tagged acoustic, bluegrass, Boston, classic rock, Doom Rock, Ethereal, Ice Dragon, psychedelic rock, Seeds From a Dying Garden, stoner rock.